This is every adopter’s worst nightmare… that the unknown history of toxic violence our freed laboratory animals have suffered through will revisit them in the form of a disease. A bad memory, physically manifested. Of the 225 dogs rescued by BFP only two have succumbed to diseases. 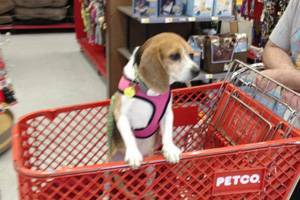 Clover was rescued by BFP 27 months ago from a laboratory in San Diego with 9 other dogs. Clover spent his first 5 years known as 5495148. His world - for five years too long - was a metal cage, gloved hands, and feeling sick, bored, and scared. Upon his liberation his personality blossomed and he did not let the years of trauma and deprivation hold him back. Clover was resilient and embraced life and the love that everyone was willing to give him. From his initial foster family, to adopters Erik and Tani and his canine siblings, Clover touched everyone who was lucky enough to know him. For 27 months Clover lived the carefree and comfortable life he deserved. He cuddled on couches, slept next to fireplaces, made trips to his Grandma’s house, had walks and adventures, and he ate… well! Clover, like all beagles, loved his food. Clover lived like a king. 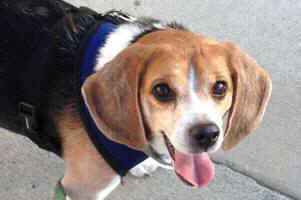 Beagle Freedom ProjectClover also served proudly as an ambassador for all other animals stuck in labs. His Facebook page entertained and educated thousands about animal-testing. 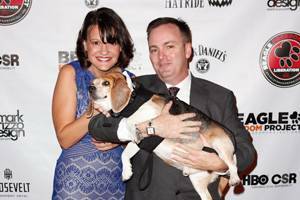 He made frequent appearances for Beagle Freedom Project on TV and even posed on the red carpet and took the stage with his parents at the organization’s Hollywood gala. Clover was the perfect reminder to people that he, and all other lab animals, are far more than just furry little test-tubes. On September 1st Clover lost his battle with kidney disease and crossed over the rainbow bridge. He was surrounded by his loving family. No matter how much we have loved them, spoiled them, cared for them, and helped them forget their past – that past could creep back up and steal their future. The truth is we don’t know exactly what Clover or most of the freed dogs suffered through, the labs make sure of that. There are no guarantees they will live long lives, but it is a risk we whole heartedly accept. Of the 225 dogs rescued by BFP only two have succumbed to diseases. But the truth of the matter, is even if we knew these laboratory survivors were short on time, we would still gladly open our homes and hearts to them. No matter if for 10 minutes, 10 months, or 10 years – after all these animals have endured, they deserve the best and should at least get to know some modicum of comfort and love. And so it was for our Clover this last week. A dog who embodied love, sensitivity, and patience. He was so sweet and generous with his affection. He deserved better than those many years he spent in a laboratory and for two years he got that with Erik and Tani. In a way the heartache we all feel over the loss of Clover is the biggest tribute to the success of Beagle Freedom Project. Most laboratory animals will never be so lucky to be known, to be eulogized, and to be personally missed. Clover will be forever missed, but not forgotten.